The event opened on a high note with the presence of WHO Director-General Dr Tedros Adhanom Ghebreyesus.Speaking to delegates at the opening session, he underlined the importance of bringing together similar countries to identify common problems and find common solutions. The pioneering role of small countries was on display throughout the meeting. Delegates presented numerous examples of the innovative ways in which their countries are implementing the Sustainable Development Goals (SDGs) and addressing complex health issues, such as building a sufficient and fit-for-purpose 21st-century health workforce. Many participants recognized San Marino’s role as host as well as its vital contribution to establishing the Small Countries Initiative in 2014. Speaking at the opening session, Dr Franco Santi, Minister of Health and Social Security, National Insurance, Family and Economic Planning for San Marino, said that the Initiative has naturally evolved from having the Health 2020 policy framework as its main point of reference to focusing on achieving the SDGs. Dr Santi commended the countries of the Initiative for being “flexible, full of resilience and prompt in planning their policies and their decision-making, in line with the global values that can pave the way for a better, more equal, more sustainable tomorrow”. The programme covering 2.5 days included sessions devoted to the economic and social impact of health systems; accelerating progress towards health equity, environmental sustainability and urban health; making the 2030 Agenda for Sustainable Development a reality; and addressing health workforce challenges. World-renowned Italian architect and urban planner Mr Stefano Boeri, best known for his Vertical Forest in Milan, also joined this session to describe how the built environment can support efforts to improve equity. 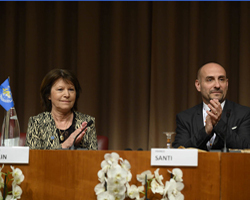 The San Marino “Statement on equity: ensuring no one is left behind” was adopted at the final session of the meeting. The delegates’ visit to San Marino was made even more memorable by the opportunity to attend the country’s Investiture Ceremony of the Captains Regent, where 2 new heads of state are installed in office every 6 months. Dr Tedros delivered a keynote address as part of the Ceremony, during which he called for the highly successful model of the Small Countries Initiative to be extended to small states around the world. Above all, the meeting provided delegates with an opportunity to share best practices, success stories and lessons learned from their own experiences, thereby encouraging a fruitful exchange of ideas. Slovenia’s decade-long efforts to strengthen health equity, most recently resulting in tailored approaches to extend prevention and screening services to vulnerable populations. Malta’s successful introduction of a strategy for transgender health care developed by a multidisciplinary team and given a dedicated budget line within the Ministry of Health. Good practices from all 11 participating countries were highlighted in a set of policy briefs on participatory approaches to reaching the SDGs, developed in advance of the event. Available online, they offer practical examples of the steps being taken by members of the Small Countries Initiative towards achieving the SDGs. The meeting concluded with the fifth meeting of focal points of the Small Countries Health Information Network and a workshop on communicating the SDGs for communications officers and journalists.